Firefox users who upgraded the web browser to the recently released version 66 may experience text vanishing issues when they use the online version of Microsoft PowerPoint. A new bug report on Bugzilla suggests that users cannot add any text permanently to PowerPoint as it vanishes immediately after typing it. Mozilla decided to throttle the distribution of Firefox 66 in the meantime until the bug is resolved. I confirmed the issue using Firefox 66 and the PowerPoint application of Office Online. While you can type text just like you could before, text that you typed would vanish into thin air immediately after hitting the Return key or switching to another element. The sheet previews of PowerPoint don't show the text either. A quick test of Word and Excel online showed that these two applications worked fine, and that the issue is limited to PowerPoint only (and probably the reason why it was not detected earlier). After selecting text using Ctrl-A, it is not possible to add or work with text as the focus is moved out of the application window. Using Ctrl-C to copy all does not work for instance. Double-clicking on text prevents text input. You cannot replace the text. Some users suggest that the issue affects newer versions of Firefox as well. The issue affects Firefox 66 or newer users who use PowerPoint online. Mozilla is pushing out a patch already that modifies a preference in the Firefox web browser. Set the value to powerpoint.officeapps.live.com. If you want to fix the Word issue as well, append word-edit.officeapps.live.com to the value and separate the two host names with a ",". The value should be powerpoint.officeapps.live.com, word-edit.officeapps.live.com afterward. A restart of the PowerPoint application should be enough to resolve the issue but if that does not work, try restarting the web browser to resolve it for good. You should be able to type text without the typed text vanishing after you stop doing so. That is a pretty serious bug which should never have passed QA. Disappointing. Tell that to Microsoft, it’s them who have to fix the issues on their online Office apps. All developers just focus to get their websites work on Chrome, nobody cares about Firefox anymore. While your statement appears to be true, it also makes me sad. 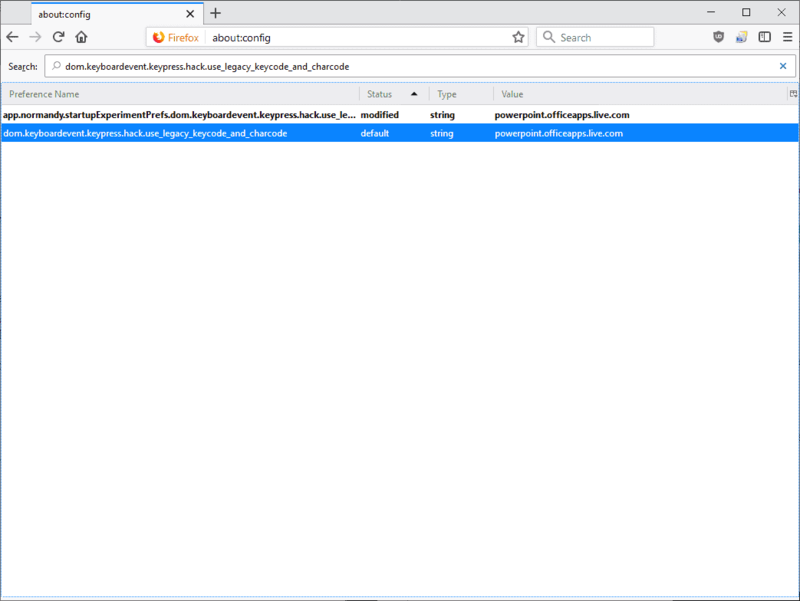 Firefox lost me and many other users because it comes out with too many bugs. They race with updated versions by increasing numbers and features but they don’t test them so they pretend users do the leg work. Firefox is no more for me because I got no time for troubleshooting their own problems. Yesterday my Firefox and my friend’s started having problems with WPAD. Other browsers are working correctly. Only Firefox is having that. Martin, There is a new Firefox release being Firefox 66.0.1 final released today. Do you maybe know or this today 66.0.1 final release (also) contain a fix for the problem (with powerpoint and word online) you were writing about, today in this article? I suppose, 66.0.1 was released because of the results at the Pwn2Own-Contest. The standalone office programs have always had a few weird behaviors if the right combination of things are done. The online versions, in addition to relying on wildly varying internet speeds and the data transfer protocols needed, can’t be all that great. I’ve never used them but have used many online document, presentation, spreadsheet, CAD, photo and video editor apps and none are as reliable as locally installed programs. For “the cloud” to become what it’s overhyped to be, data transfer reliability has to dramatically improve. So does security.